Electric ovens are an American staple, and learning to use one is simple. Even if you've never operated one, you can get cooking in a short amount of time. 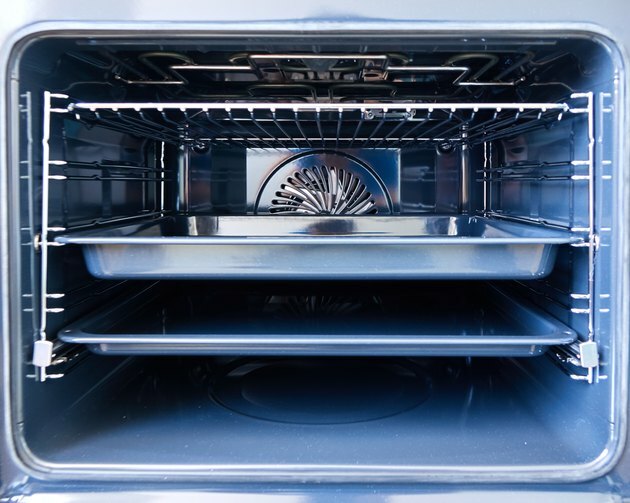 The main components of an electric oven include the top and bottom heating elements, a timer and the self-cleaning control. Like the name implies, electric ovens are powered by electricity. Gas stoves use a gas line of propane or natural gas to power the oven and stove top. Electric ovens are slightly cheaper than gas ovens, making them appealing to buyers. Many homes are prewired for electric ovens, so many homeowners don't have a choice unless they want to spend extra having a gas line installed. The electricity sent to the oven is regulated by multiple temperature settings. The oven is usually combined with the range stove top, but some are separate and set into walls. Electricity heats wires that are surrounded by metal sheaths. These are located in both the top and bottom of the oven. The sheaths heat the interior of the oven, and when the desired temperature is reached, they automatically cut off to regulate cooking. Some will also have convection fans to dispense hot air in the oven. Keep in mind the two main heating elements are located in the top and bottom of the oven. When you set your oven to bake, the bottom heating element is activated and used. When the oven is set to broil, the top heating element is used. When following recipes, make sure you're setting the oven to bake or broil according to the directions. Preheating the oven allows the heating elements to reach the exact temperature needed for cooking. Some ovens will have a knob that sets the time, with a button for preheating. Others will have an electrical touch interface to digitally set the desired heat and will automatically preheat. It will take a few minutes for the oven to heat, and the heat will be evenly distributed throughout the oven. A chime or beeping sound will alert you to when it's ready. The timer will also use a chime or beep; much like an egg timer, you can set the amount of time you need your food to cook on the timer. This is either a knob or a button on the interface. When your oven is heated and the time set, all you have to do is set the table for dinner. The main bonus of many electric ovens is the self-cleaning feature. Like the preheat function, this feature can be located on the range as a touch button or knob, or as a locked lever on the oven door handle. The oven uses heat to clean, reaching temperatures over 800 degrees Fahrenheit to decompose food spills and residue into ash. The oven door usually locks to make sure it's not accidentally opened during the cleaning period. Cleaning can take from an hour to three hours, and when complete, the ash can be wiped clean with a damp cloth.